News of toxic waste dumping in Somali waters has circulated since the collapse of the Mohamed Siad Barre military regime in 1991, but because of the lack of a functioning central government and general lawless state of Somalia there has been little systematic investigation done on both the source of the toxic waste and its impact on communities living along Somalias 3,300km coastline. The issue received renewed attention in 2004, however, when a Tsunami surge washed up containers containing hazardous waste in Southern Somalia. According to a report from Common Community Care (2006), a local nongovernmental organization, radioactive materials and hydrogen peroxide toxic wastes were found in different locations in Southern and Central Somalia. Common Community Care (CCC) stated an unconfirmed number of fishermen had died from health conditions at locations where containers were found. In Barava district of Lower Shabelle region, local residents spoke of sudden death and skin rashes. Communities reported mass death of fish. Investigations in the 1990s linked the dumping of toxic waste to European front companies associated with the Italian mafia, a claim that was again made in 2012 and which the European Union is reported to be investigating. A 2005 United Nations Environmental Programme (UNEP) report says most of the waste has been dumped on seashores in containers and disposable leaking barrels. And former United Nations Envoy to Somalia, Ahmedou Ould-Abdallah, told Aljazeera in 2008 that the world body had reliable information that European and Asian firms were continuously dumping hazardous waste off Somalia. Project Details There are no figures for the estimated amount of waste dumped in Somalia. An Italian government investigation in the 1990s found that 35 million tonnes of waste had been exported to Somalia for $6.6 billion, but this figure would not include other countries whose waste ended up being illegally dumped in Somali waters. What is clear is that the cost of exporting waste is a far cheaper option for developed countries: a UNEP report states that it costs $2.50 per ton to dump toxic waste in Africa compared to $250 per ton to dump waste in Europe . A number of writers have linked the origins of the piracy phenomenon along the Somali coastline to efforts by communities to protect their livelihoods from toxic dumping and illegal fishing. Other Reports of fish dying due to contamination. Other Reports indicated birth deformities and cancerous growths in some coastal communities, and deaths by unknown causes. Why? Explain briefly. There is nothing to indicate that the dumping of toxic waste has stopped. Even if it had, communities along Somalias coast will pay the health and environmental consequences in the years to come. Hussein, Bashir Mohamed (2010). The evidence of toxic and radioactive waste dumping in Somalia and its impact on the enjoyment of human rights: a case study. Available at: Accessed 7 January 2013. Nuurre, AbdiRasaq H. (2012). Toxic Mafia. Available at: Accessed 7 January 2013. Greenpeace (2010). The toxic ships. Available at: Accessed 7 January 2013. AFP (2010). Toxic waste: Somalia seeks help. Available at: Accessed 7 January 2013. Hussein, Qalinle (2011). 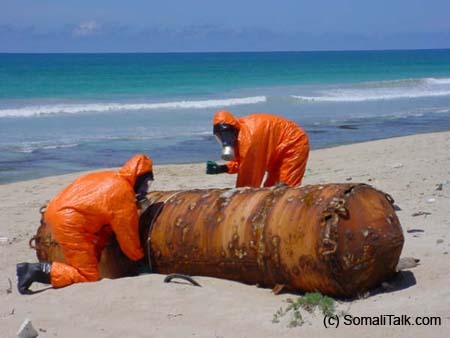 Somalia: Radioactive waste surfaces in the coastline. Available at: Accessed 9 January 2013. Milton, Chris (2009). Somalia used as toxic dumping ground. Available at: Accessed 7 January 2013. Mwangura, Andrew (2010). Somalia: Pirates or protectors? Available at: Accessed 7 January 2013. Najad Abdullahi (2008). Toxic waste behind Somali piracy. Available at: Accessed 10 January 2013. Rettman, Andrew (2012). EU studying links between Italian mafia and Somalian pirates. Available at: Accessed 7 January 2013. Al Jazeera (2009). People and Power: The toxic truth. Available at: Accessed 7 January 2013. Democracy Now (2009). Somalia Piracy Began in Response to Illegal Fishing and Toxic Dumping by Western Ships off Somali Coast. Available at: Accessed 7 January 2013. United Nations Webcast (2010). Fourteenth Session of the Human Rights Council (special session on the adverse effects of the toxic wastes and the enjoyment of the human rights). Available at: Accessed 24 January 2013. SomaCent Development Research (2010). Evidence and pictures of toxic waste dumped in Somalia. Available at: Accessed 24 January 2013.